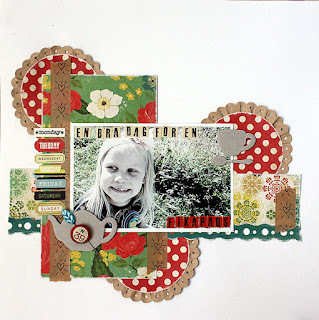 I have a short post for you today with a layout I made based on a sketch from Lillblomman skissar. I've been digging out some old, but still amazing, Echo Park papers. The photo is from last spring, when Agnes and I went for a picknick on the meadow up in the woods behind our house. We love going for picknicks like that, and right now, we are discovering so many new places around the farm, perfect for that. Yesterday, we got the boat into the creek, so soon we can start discovering all the little islands out by the sea. I love this time of the year, and I love spending it here, on the farm and in its surroundings. Tomorrow we will celebrate Walpurgis Night with a big bonfire, where our Albin and the rest of his scout friends will be the ones setting it on fire, and on Tuesday, we will be attending Agnes' dance show. So, there's a lot of things coming up. Mmmmm riktigt yummie layout och jag gillar också EP papper! Vad skoj att du ville vara med! Kram!